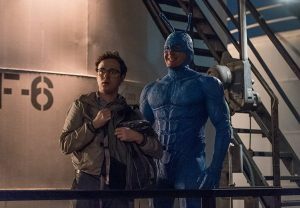 When The Tick came back as live-action, I was rather worried. Remaking a cartoon into a live-action movie is often a bad idea, so, a whole show is a gamble of epic proportions. And, now that I’ve seen some of it, it indeed has major problems. Now, I’m not going to spend a lot of time ripping apart the CGI—even if it is abysmal. 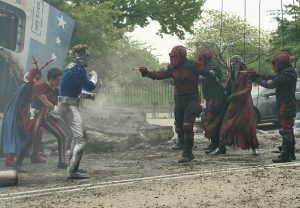 This is a wacky superhero comedy and clearly has a limited budget. 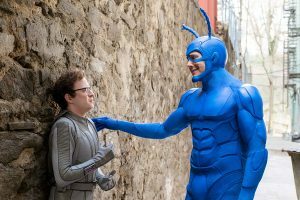 The Tick’s, character-appropriate, destructive roof-top leaping doesn’t look right, and the fights scenes are limited. But that’s a forgivable problem. The tonal whiplash is less so. The Tick wants to be two things. The first is a show where an obsessed man named Arthur deals with the mental scars of a supervillain murdering every single one of his favorite superheroes right in front of him—after those same superheroes’ ship falls on his beloved brother. 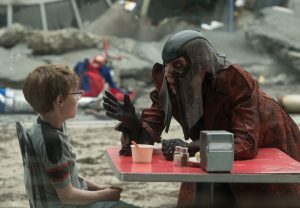 It wants to be a tale of trauma and the costly aftereffects of superhero battles. A tale about this one man coming into contact with an amnesiac superhero who can’t function without him and demands to make him come into the world of superheroes and have Arthur move on from his trauma by becoming an active force against the things that did that damage to him. And I like that a lot as a premise. But it’s also a show set in a world where superheroes are ridiculous agents of chaos that play up the inherent oddness that comes with a world that has so many superheroes. It’s a show full of background audio gags and oddly anticlimactic superhero names. Traditional jokes and comedy are occasionally peppered in but most of the humor comes from the sheer surrealness and absurdness of the situations. I like this as a premise. But I’m sure you see the problem here. It’s not a good combo. At one point, they manage to sort of meld the tones when it’s suggested that The Tick is a figment of Arthur’s imagination. In those few moments where they maintain the possibility, it seems like they found a perfect way to have a ridiculous person like the Tick around with the otherwise serious Arthur plotline. And it’s not the only swing and a miss. Later, The Tick admits that he can’t recall much of his past or even think well without Arthur around. It’s touching until you recall this is the same character who keeps pushing Arthur to do various dangerous things while ignoring his wants and wishes—and nearly gets him killed. I realize the same could be said of their dynamic in the animated show, but the live-action series has blood and gore and lasting violence. So, not exactly all playful anymore. 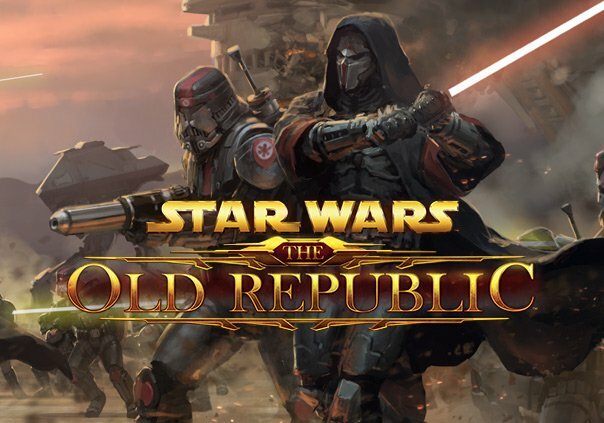 Now, I’ll admit, I have not seen past episode three. Maybe they strike a good balance later, but I can’t see how from where I’m standing. I do have one bit of praise. 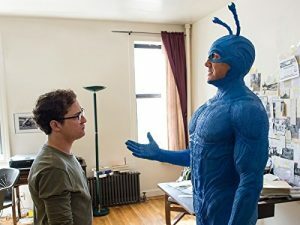 The actor playing The Tick is amazing. In a vacuum, his performance is mind-blowing. Peter Szymon Serafinowicz does the best job. From his monologue to his facial reactions, he’s the character given life. I just wish such a perfect casting decision was married to a better show. In 2018, a superhero parody made for an older audience, one that really goes clever with its satire, would be amazing. Like Deadpool, but serialized. But The Tick just doesn’t quite scratch that itch.